Scale Clean is specifically for the removal of water scaling . An application is quite easy for everyone that scales are washed off while washing a car. Common water stain removers are water stain wax removers, meaning that containing coarse particles of compounds in wax. When those products are used, it is quite hard to remove water stains evenly and leaves cleaning unevenness and contamination due to the wax remaining on the applied areas. Also. this cleaning job with this type of waxes creates an another work to polish to remove the wax off after. Scale Clean will not make cleaning unevenness and contamination on the applied areas. The product will be simply washed off by water so that there is no requirement for polishing after an application. Scale Clean is not only relying on either polishing power of polishing agent or washing capability of washing agent. The product perfectly contains the both; the ultra micro polishing agent with the infiltrable alkaline component detergent, hence scales are removed easily without rubbing surfaces strongly. As the compound used for Scale Clean is extremely gentle and fine, it does not have capabilities to polish paint surfaces so your car will have zero damages. The roll of the compound is to rub off contamination which has been peeled off from surfaces by the detergent, Scale Clean can also be used for new cars and coated cars. Please note that this product is specifically made for the removal of water scales . Scratches or water spots may not be removed. it is recommended to engage Scratch Cut for the removal of minor scratches and water spots. The majority of water stain removers sold in shops are made for a wide range of cars, means these products are just acceptable for many cars. They may be good but not the best. The painting of cars varies depending on manufacturers and types, years and colors and many others. 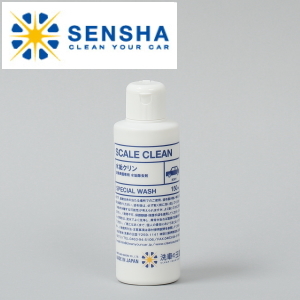 However, SENSHA believes that it is necessary to use different mixture types of scale cleaners to match various specifications, characteristics and conditions of each car. It is critical to use the scale removal product suited to your car in order to work effectively and safely. Obviously, you will damage your car by using unsuited products, require more time to complete work and even result in making issues which cannot be fixed. When you purchase Scale Clean, we will ask your car information (manufacturer, model, year of manufacture, body color and things and areas especially wanting to improve) and we select the best match mixture Scale Clean for you based upon the information provided. If your car information is not provided, we will select one suited for a wide range of cars. Please provide your car information. It may take a little longer to deliver your product when we are receiving an excessive amount of orders. Please kindly understand this.